Failing to clean in between the teeth means you are failing to clean up to 40% of the toothss surface. That might be surprising and perhaps explains to you why, your dentist regularly reminds you to floss. Flossing, or using interdental brushes helps to clean that 40% not reached by normal toothbrushing. Important flossing is, many will agree, that it can be awkward, time consuming and painful if the floss cuts up into the gum. A tool that many find useful is a an electric water flosser. Pushed out at pressure, water finds its way in between teeth an under the gumline to dislodge the plaque and debris that would have a negative effect on your teeth if it were not removed. This cordless option allows this without the restriction of a power cable that is necessary with the countertop options. Open the reservoir door and fill the compartment with water until it is a little less than full. Close the door and ensure a tight seal. Choose the pressure setting of your choice, by pressing the appropriate button on the unit. Place the tip of the flosser into your mouth. Close lips enough to prevent splashing, while still allowing water to flow from mouth into the sink. Aim water at the gumline at a 90 degree angle. Follow the gumline and pause briefly between teeth. Complete on both upper and lower teeth. Designed for those who are on the go travelling or do not have a power outlet in the bathroom, this cordless water flosser can be more convenient, because it is portable. Where countertop units require mains power, the cordless have the battery built right in, so you can go where you like and use when you like. Quite a few cordless options exist and it is US brand Waterpik that is considered the market leader, but their products often come at a market leading price, so how do more cost effective options like INSMART compare? Read on to find out. At the time of review, INSMART make just 1 version of this cordless water flosser. However, what appears to be the case is that the whole cordless unit is an off the shelf option that INSMART have branded. What this means is that theoretically, you or I could go to the factory that produces them and get the exact same product, but just have our name put on it. The only apparent unique element is the brand. Now, there are potentially some other differences, such as color and box contents but what I have noticed is that there are some differently named water flossers that appear to be technically exactly the same as the INSMART. This means for the most part, all that I explain about this cordless water flosser applies to the other brands too. If you take a look yourself, you will be able to see they are all very similar, so whether you opt for INSMART, Cozine, Mospro, Apiker, VAVA or Zerhunt, the experience should be essentially identical.. Here are a list of the pro’s and cons having used this cordless oral irrigator. Cordless – Not bound by wires you are free to move around when using this. Ease of use – Feels a lot easier to use than regular string floss. Rechargeable battery – A built in battery is rechargeable and can be topped up in just 4 hours. Box contents – Nice number of inclusions. Effectiveness – No clinical backing/ADA seal of acceptance. Size – A bit chunky. Not something you will necessarily want to throw into a weekend bag if you are travelling light. Replacement nozzles – Not that easy to source, need to find compatible options. Messy – Whilst you can master a technique, the steps involved and the amount of water pushed into the mouth means this is not the most enjoyable or flattering experience, you need a sink and even then you can make a bit of a mess. Price – Not much more to own the market leading brand. Cordless water flossers have a place. If you travel frequently, if you do not have a power socket in your bathroom or if you simply do not want to be restricted by cables, then a cordless flosser may very well be for you. However, I want to make sure you are aware of the countertop options. You see, whilst larger, they are often similarly priced, but can over come common complaints of cordless options, with more power and larger water tanks. With either, ideally you need to be lent over a sink, to get rid of the water from the mouth, so I do encourage you to assess your usage as to whether a cordless option is right for you. I have found that those who wear braces often like the cordless flossers, as it can be put in a bag and taken to work, school or out with you, so you can ensure a clean brace after eating. A definite appeal is the portability, but with a water tank built in there are inevitably larger than most would like, but physics mean they have to be. At around 9 inches in length (nozzle removed) and 3-4 inches wide, these are not all that compact. If you travel light or have limited space within your carry on luggage as good as water flossers are, you might want to consider whether you want such valuable space taken up with such. INSMART do provide a travel pouch for it, to protect it and keep the unit and the nozzle together in transit. The way in which is charges is good too. The built in rechargeable battery lasts approximately 2 weeks between charges, but you can charge this unit in just 4 hours from a USB port, no bulky power adapter required. The cordless flosser is made up of 3 key parts. At the base of the unit is the detachable reservoir or water tank. It unscrews from the upper part of the flosser, that is White in color and houses the battery and pump. A plastic tube runs from this part into the reservoir beneath it to draw up the water. On the top of the unit is the detachable nozzle. This is what delivers the jet of water from the unit into the mouth and ultimately cleans away the plaque and debris. The water tank is a smoked grey color with a White INSMART logo on the front. At the rear, is a door to the tank, that is opened to allow you to fill it. Push the door closed once filled and a rubber seal ensures the water stays in the reservoir. Whist the reservoir unscrews from the unt, you need not unscrew it each time, this is only for maintenance and cleaning. It has a capacity of 7oz/200ml which gives up to 45 seconds of usage time. The power and cleaning mode controls are found on the front of the flosser. Positioned within a sort of teardrop shaped Black panel, you have the power on/off button with the mode button below it. The buttons have a concave design and are not all that resistive to the touch. They are easier to press than a lot of competing products. One press of the power button will turn the unit on, whilst another press will turn it off. Be aware, if there is water in the tank and the button is pressed, water will immediately leave the nozzle at the top. The mode button can be pressed before or during a clean to change the pressure delivered when the unit is powered on. Below the mode button are the names of each cleaning mode with an LED. The LED lights up to show which mode is selected. Keep pressing the mode button to cycle through them until the desired mode is selected. Normal mode is the most powerful with 120 PSI for intense deep water flossing. Soft is much more gentle, great for sensitive gums with just 40 PSI of pressure. Pulse alternatives the pressure to give a massaging effect to the gums and moves between 40 and 120 PSI. The design of the unit makes it a little bulky and a little weighty, particularly with water in it. On the back of the unit are a series of raised ridges in the body, which offer gripping points for the fingers. At the top of the unit the design is such that there is a lip under which the fingers naturally sit and the flosser rests on. Back at the front, below the Black panel is a protruding rubber grommet. Remove this to access the charging pins. A proprietary connector, the supplied USB cable fits into this and charges the internal battery. The rubber grommet needs to be replaced to keep the water resistance. Sadly, it is small and very easy to lose, so be careful. just below the top edge of the flosser is a button. This is the eject/release button that loosens the hold of the nozzle found on the top of the unit. In the box are 4 standard jet tips/nozzles. Pushed into the hole, they are clipped into place. Whilst clipped in place, they can be rotated a full 360 degrees. Ridges around the base of the nozzle allow a resting point for fingers and grips to twist the nozzle when in use. Each nozzle should be replaced approximately every 6 months. This means that with the 4 nozzles included you get about 2 years worth of use before you need to consider replacements. Here though comes a problem. INSMART and many of the other brands I listed in the variants section of this review, simply do not sell replacement nozzles. This is disappointing and leaves me with a bit of a bitter taste in my mouth as many consumers will be quite put out by this. Thankfully you should be able to source some, albeit from a different brand. I am led to believe that these Broadcare ones (view on Amazon) should fit. It is a trial and error process though. Not good. My hands on testing is not based on any clinical trials or analysis, simply me at home using it. The actual clean provided by the flosser is pretty good and I would really struggle to tell in a blind test whether I was using the INSMART or the market leader Waterpik. 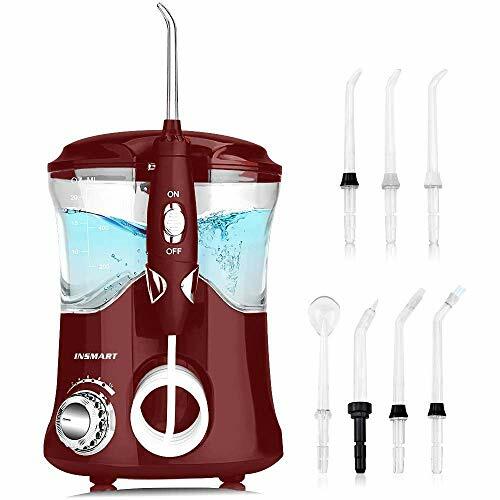 But, Waterpik have done much more testing and have shown on countless occasions how their products are proven to bring beneficial oral health. I won’t claim that you will get the same results, but there are so many variables, for the extra spend, one could question whether the Waterpik really justifies the extra expense. The availability of replacement nozzles is 1 reason, but peace of mind does come from knowing that the products have been tested in clinical settings. The American Dental Association (ADA) have too awarded Waterpik their Seal of Acceptance. To achieve such an accreditation, the product must demonstrate efficacy according to requirements developed by the ADA Council on Scientific Affairs. This flosser does not boast such an accreditation. Whether you use INSMART, VAVA, Waterpik or any other cordless water flosser, the general approach for cleaning is the same. I outline the steps earlier in this review, but you need to aim the jet of water at the gumline at 90 degrees. The 7oz capacity to the tank is on par with the competition, but for some it might not be enough capacity to complete a floss. You get about 45 seconds of usage time from it, so you need to get your technique nailed if you do not want to have to refill until your next flossing session. The first few uses of a water flosser can be messy. You need to learn how to adjust the flosser in the mouth and move your lips to let excess water drain, but not splash everywhere. Once perfected, compared to string flossing it is much easier and the water can feel soft and invigorating on the gums, depending on the mode. You can definitely feel it working. The unit actually has an automatic power off feature that kicks in at 2 minutes. It’s a nice touch and will stop you draining the built in battery, but given the water is all used up within about 45 seconds, most will turn the unit off otherwise it will be running for a full minute without any water. It would be nice if there was a pacer built in, to aid with even cleaning of the teeth and gumline, but given the relatively small capacity of the reservoir I understand why this is excluded. It does make a bit of noise when running, louder than some might expect, but after all there is a powerful pump inside. The nozzles and cleaning modes on offer with this flosser will accomodate the needs of most, including those with braces, but Waterpik do offer a broader array of tips that are well suited to specific users needs. Admittedly the setup and day to day cost is greater, but their Orthodontic tip has bristles that can brush across the brace and the Pik Pocket tip a soft rubber tip that reaches in below the gum line to clean those periodontal pockets. The INSMART flosser is water resistant, so if you chose you can use it in the shower or rinse it under the tap without fear. It comes with a 1 year warranty, ok, but not the more standard 2 years now offered on many products. Failing to clean properly between the teeth and gums can lead to a buildup of bacteria and plaque that in turn can result in gum disease. The cordless flosser removes bacteria deep between teeth and below the gumline where brushing and traditional flossing can’t always reach. The flow of water does too massage and stimulate the gums to improve circulation and keep your gums strong and healthy. For those looking for an easier option than floss, water flossers are certainly worth serious consideration. Fitted inside the handle and not designed to be removed is the rechargeable battery. It is a Lithium-Ion (Li-Ion) battery with a 1400mAh capacity. It can be charged in just 4 hours and once charged can give approximately 2 weeks of usage time, based on 1 flossing session per day. The cordless flosser does not exactly use a standard charging adapter. On the front of the unit, you remove a rubber grommet which fits over and protects the charging port and pins. The proprietary style connector is almost like a figure 8 shape and in the box comes a USB charging cable. On one end of the cable is the proprietary connector and on the other a standard USB connection. This USB connector can be connected to a USB port on a computer or laptop, to a power bank or to a mains socket. In the box too comes a USB to 2 pin US plug adapter which you can also use. This adapter allows the flosser to be recharged from the US electrical socket. Do not use it whilst connected to a power supply. Detach the cable and replace the rubber grommet that fits into the port on the front of the unit. The fact that it charges via USB makes it good for travel as USB connectors are international. When the battery is low you do not get any indication other than hearing the motor inside the unit slow or stop, there is no battery/charge light. $40 is the retail price of this cordless water flosser. Where some products have an artificially high suggested selling price and sell for a lot less, here it is just the best price available. There is no denying that this price is indeed very attractive and whilst different retailers do sell it for different prices, at the time of writing Amazon were the cheapest retailer to buy it from. Unlike market leader Waterpik, this model does not appear to be stocked in stores like Walmart, Bed Bath and Beyond, Target or CVS. I have found it on ebay, but prices are typically higher, and nobody wants to be paying more than they need too. With 4 nozzles included in the box, you can easily get 2 years of use from the flosser before you need to consider purchasing replacements. Here though comes a little problem. I was unable to find INSMART replacement nozzles for this flosser. But, as identified earlier, this model is essentially identical to that from other brands and I am led to believe that the nozzles are the same. Therefore this pack of 5 for $8 on Amazon should fit. At just $1.60 each this is very cheap, particularly when you consider Waterpik charge $5 per jet tip. This nozzle availability applies to many of the other brands that sell this cordless water flosser. You might not think about this on first instance, but for many it is a problem that comes about a year or so after purchase and can taint what might have been a good deal. I am sure many just dispose of the flosser after a couple of years, but if its still working, why do so? Nozzles are cheap to produce and source. Replacing the whole unit is an expensive route to take. It is very disappointing that this should be the case and I wish these brands thought more about ongoing support for customers. Waterpik might be more expensive with their flossers ranging from about $35 to $100 but at least you can be assured of replacement nozzles. And whilst I say Waterpik are more expensive, the Cordless Freedom WF-03 which runs on AA batteries can be had for less than $40 and is similarly features. Whilst INSMART comes with a 1 year warranty, we find the typical life of a cordless flosser to be 3 years, so we like to work out the ownership cost over this time. Based on 1 user, there will be the need to buy an additional 2 nozzles over and above those included in the box. This will take the purchase price to $43.20 or $0.04 per day. The most premium Waterpik cordless option is $0.06 per day. Compare this to traditional string floss that works out at about 2-3 cents per day and it’s about 2 times more expensive. It is without doubt a luxury and by no means essential, but the time saved, the simplicity and potential health benefits for many make this a worthwhile investment for some, but consider whether the premium alternatives are better for you. If you are really keen to get the absolute best price, shop around and research these different brands, as you might find the exact same cordless irrigator, branded by another company but at $5-10 cheaper. Long term testing is the best way to find out how well a product really fares. Before publishing our reviews on Electric Teeth, we do use each for 2 or more weeks to be able to give you honest, hands on user feedback. Whilst we would like to tests for months, it is not always possible. Should we hear of or experience any significant issues after publication, this review will be updated. However, whilst we can’t test for extended periods like you will. Having handled so many similar products, we have an excellent knowledge of possible failure points and what makes a good and bad product. INSMART have not given me any serious causes for concern through my hands on testing. The build quality is on the whole good and more than satisfactory. The seal around the water tank appears to be good and battery performance just fine. My biggest criticism or cause for concern is the small removable rubber plug that goes into the charging connector. Its small and easy to lose. It does come with a 1 year warranty, but sadly, not a 2 year warranty like some products, so this is perhaps a little disappointing. All things considered what you have on offer here from INSMART and the equivalents from other brands is pretty good. Performance and the clean is good as is the choice and box contents. They are more cost effective than the market leader Waterpik, but do not come with the added peace of mind that is the ADA Seal of Acceptance and the 2 year warranty. More expensive most Waterpik products are, there are some compelling reasons to opt for that over this INSMART offering. It would generally be my recommendation — find a few of them here in our best water flosser roundup. But if you are on a strict budget and cannot justify the extra spend, you are getting a pretty solid and robust offering here and I am sure your oral health will benefit. Based on 1 user per day you will get about 2 weeks from the flosser. Yes. It comes with a USB cable as well as a 2 pin US USB plug adapter. Can I use mouthwash in the INSMART? You could, but it would be expensive and wasteful. Best adding a dash into the water used in the reservoir for a burst of freshness. Approx 7oz/200ml which will last for 45 seconds. Can I use the INSMART in the shower? Yes, it is water resistant. Yes a microfiber drawstring pouch is included to put the flosser in when travelling. My gums bleed when I use cordless flosser. Is that normal? Bleeding gums may be a sign of infection and a little bleeding can be normal when starting a new oral care routine, as you may be cleaning in areas not previously reached. However, if bleeding is excessive or does not stop within a few days of regular use, consult a dental professional. Do you own or have you used the INSMART Cordless water flosser? Let us know what you think about it, and let others who may well be considering purchasing one know your opinions before they do.